© 2013 The MITRE Corporation. All rights reserved. 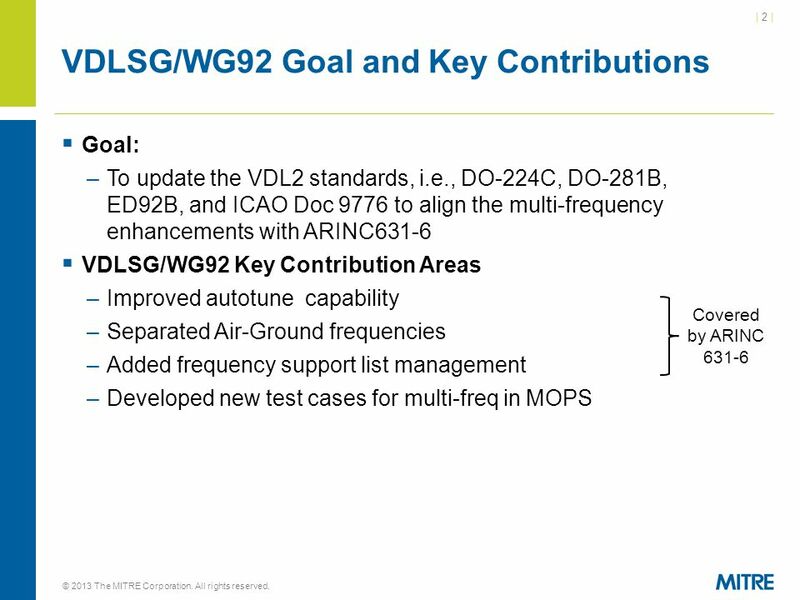 Dongsong Zeng– VDLSG Chair Presented to SC-214 Plenary May 8, 2013 VDLSG Status Report and Request for. 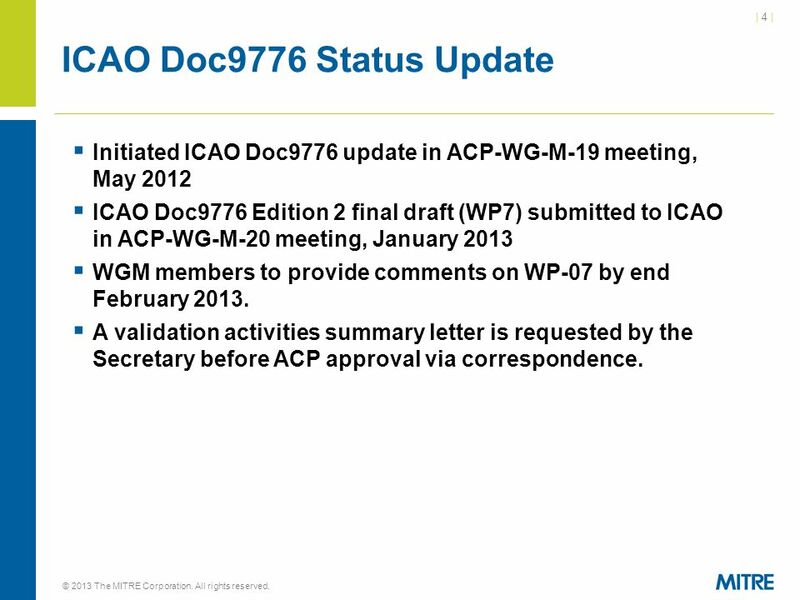 4 | 4 || 4 | ICAO Doc9776 Status Update  Initiated ICAO Doc9776 update in ACP-WG-M-19 meeting, May 2012  ICAO Doc9776 Edition 2 final draft (WP7) submitted to ICAO in ACP-WG-M-20 meeting, January 2013  WGM members to provide comments on WP-07 by end February 2013. 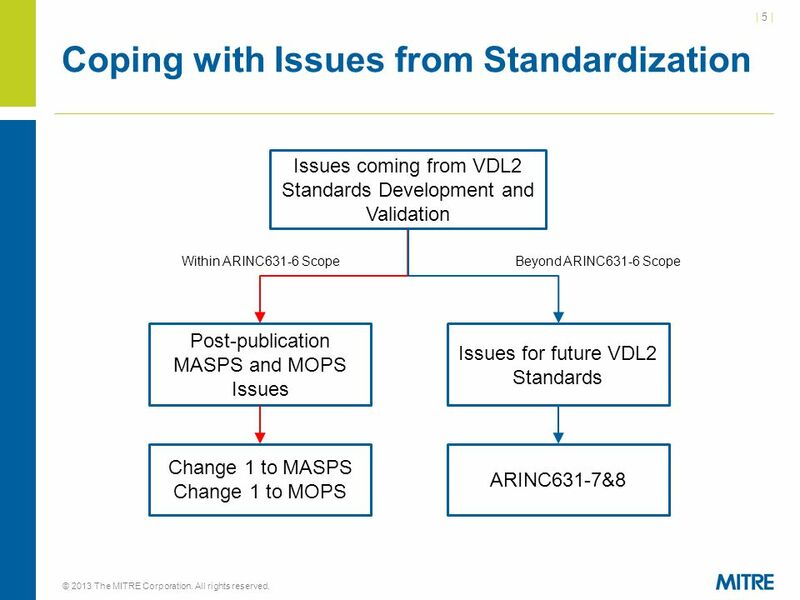  A validation activities summary letter is requested by the Secretary before ACP approval via correspondence. © 2013 The MITRE Corporation. All rights reserved. 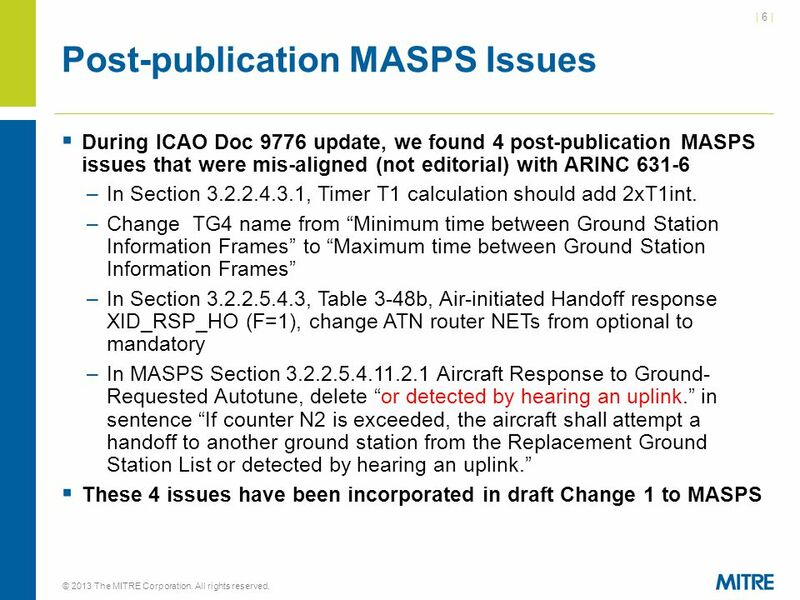 6 | 6 || 6 | Post-publication MASPS Issues  During ICAO Doc 9776 update, we found 4 post-publication MASPS issues that were mis-aligned (not editorial) with ARINC 631-6 –In Section 3.2.2.4.3.1, Timer T1 calculation should add 2xT1int. 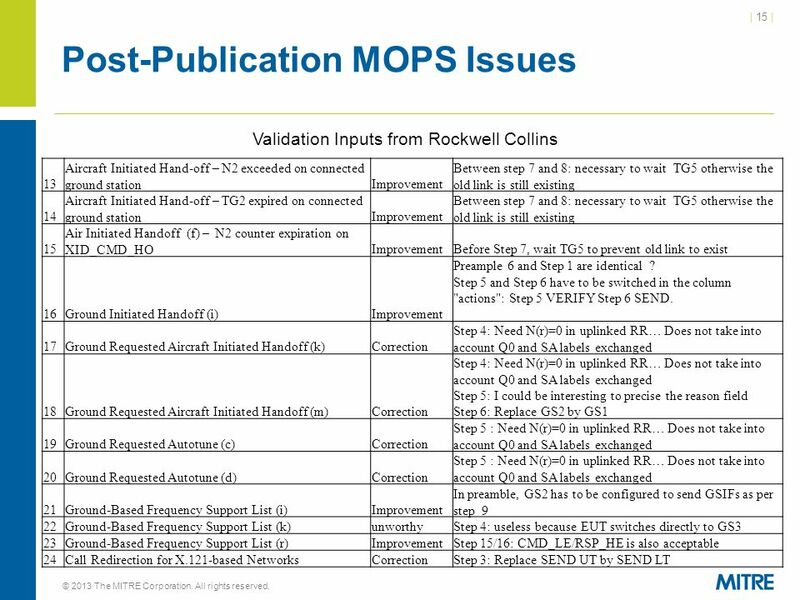 –Change TG4 name from “Minimum time between Ground Station Information Frames” to “Maximum time between Ground Station Information Frames” –In Section 3.2.2.5.4.3, Table 3-48b, Air-initiated Handoff response XID_RSP_HO (F=1), change ATN router NETs from optional to mandatory –In MASPS Section 3.2.2.5.4.11.2.1 Aircraft Response to Ground- Requested Autotune, delete “or detected by hearing an uplink.” in sentence “If counter N2 is exceeded, the aircraft shall attempt a handoff to another ground station from the Replacement Ground Station List or detected by hearing an uplink.”  These 4 issues have been incorporated in draft Change 1 to MASPS © 2013 The MITRE Corporation. All rights reserved. 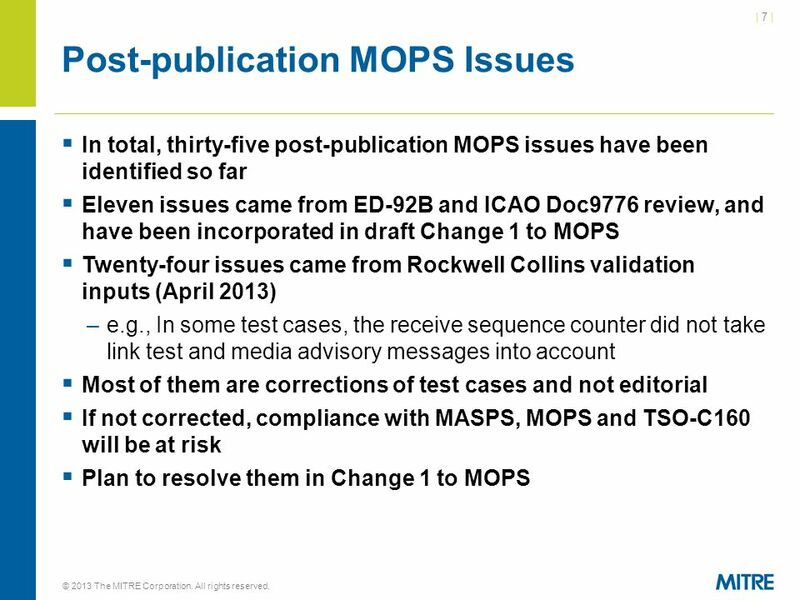 7 | 7 || 7 | Post-publication MOPS Issues  In total, thirty-five post-publication MOPS issues have been identified so far  Eleven issues came from ED-92B and ICAO Doc9776 review, and have been incorporated in draft Change 1 to MOPS  Twenty-four issues came from Rockwell Collins validation inputs (April 2013) –e.g., In some test cases, the receive sequence counter did not take link test and media advisory messages into account  Most of them are corrections of test cases and not editorial  If not corrected, compliance with MASPS, MOPS and TSO-C160 will be at risk  Plan to resolve them in Change 1 to MOPS © 2013 The MITRE Corporation. All rights reserved. 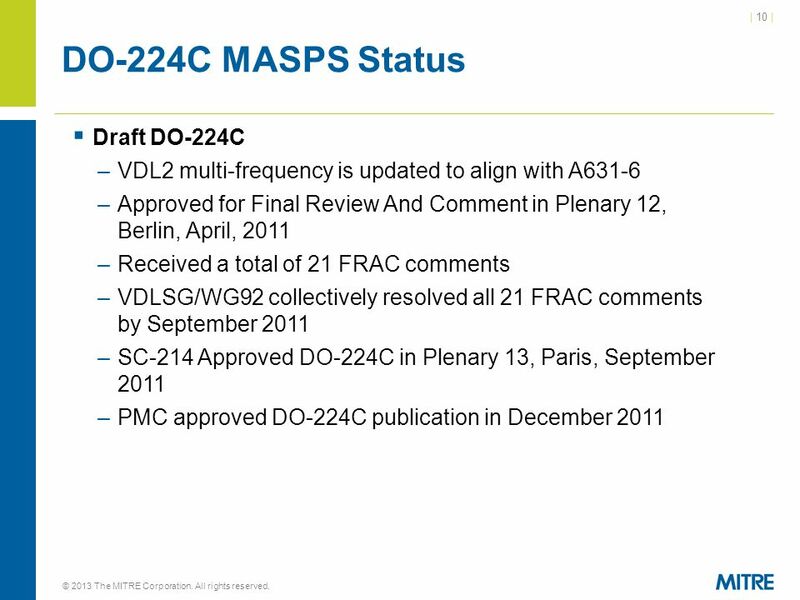 10 | 10 | DO-224C MASPS Status  Draft DO-224C –VDL2 multi-frequency is updated to align with A631-6 –Approved for Final Review And Comment in Plenary 12, Berlin, April, 2011 –Received a total of 21 FRAC comments –VDLSG/WG92 collectively resolved all 21 FRAC comments by September 2011 –SC-214 Approved DO-224C in Plenary 13, Paris, September 2011 –PMC approved DO-224C publication in December 2011 © 2013 The MITRE Corporation. All rights reserved. 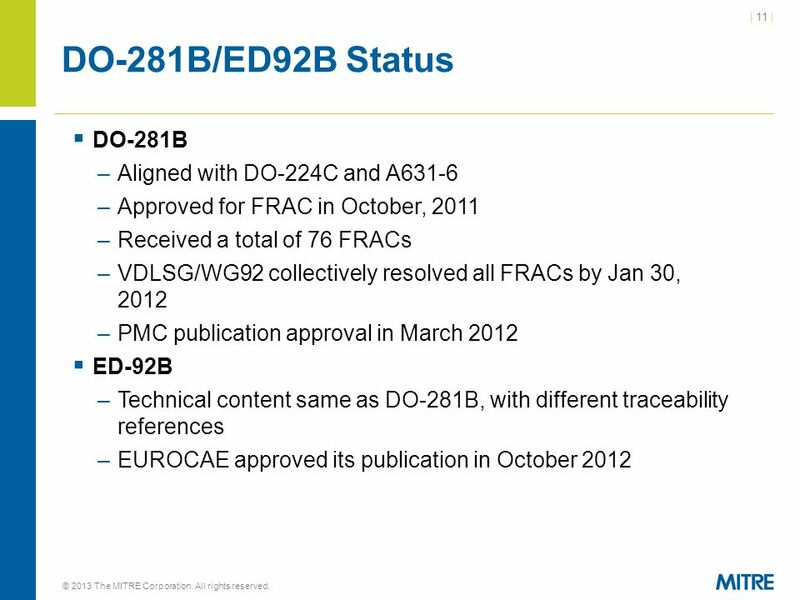 11 | 11 | DO-281B/ED92B Status  DO-281B –Aligned with DO-224C and A631-6 –Approved for FRAC in October, 2011 –Received a total of 76 FRACs –VDLSG/WG92 collectively resolved all FRACs by Jan 30, 2012 –PMC publication approval in March 2012  ED-92B –Technical content same as DO-281B, with different traceability references –EUROCAE approved its publication in October 2012 © 2013 The MITRE Corporation. All rights reserved. 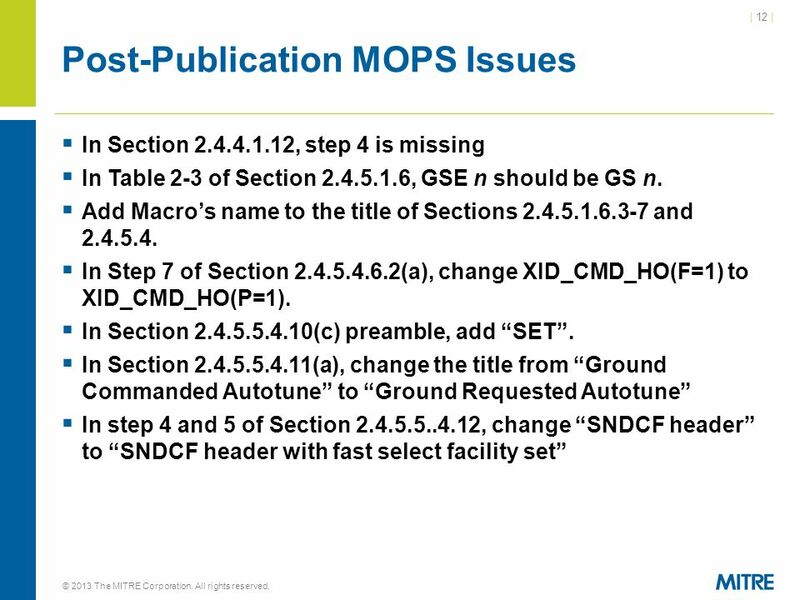 12 | 12 | Post-Publication MOPS Issues  In Section 2.4.4.1.12, step 4 is missing  In Table 2-3 of Section 2.4.5.1.6, GSE n should be GS n.  Add Macro’s name to the title of Sections 2.4.5.1.6.3-7 and 2.4.5.4.  In Step 7 of Section 2.4.5.4.6.2(a), change XID_CMD_HO(F=1) to XID_CMD_HO(P=1).  In Section 2.4.5.5.4.10(c) preamble, add “SET”.  In Section 2.4.5.5.4.11(a), change the title from “Ground Commanded Autotune” to “Ground Requested Autotune”  In step 4 and 5 of Section 2.4.5.5..4.12, change “SNDCF header” to “SNDCF header with fast select facility set” © 2013 The MITRE Corporation. All rights reserved. 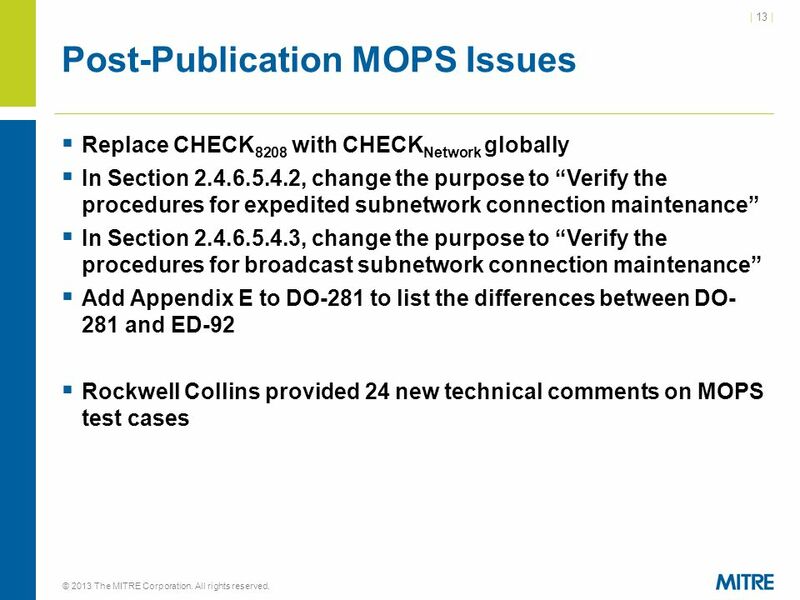 13 | 13 | Post-Publication MOPS Issues  Replace CHECK 8208 with CHECK Network globally  In Section 2.4.6.5.4.2, change the purpose to “Verify the procedures for expedited subnetwork connection maintenance”  In Section 2.4.6.5.4.3, change the purpose to “Verify the procedures for broadcast subnetwork connection maintenance”  Add Appendix E to DO-281 to list the differences between DO- 281 and ED-92  Rockwell Collins provided 24 new technical comments on MOPS test cases © 2013 The MITRE Corporation. All rights reserved. 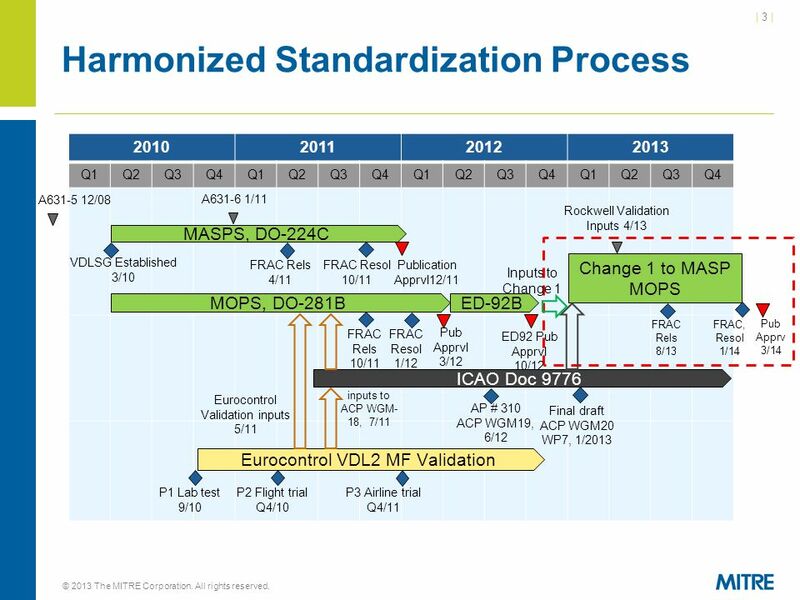 Download ppt "© 2013 The MITRE Corporation. All rights reserved. 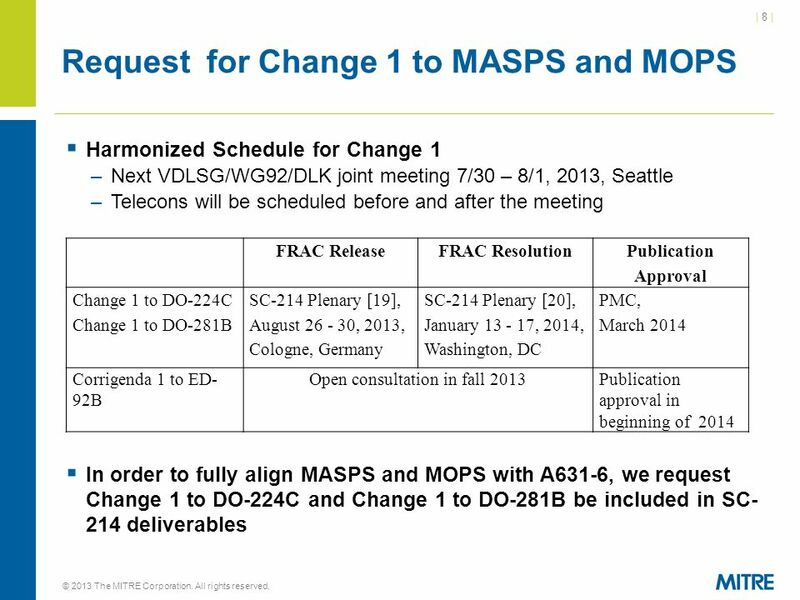 Dongsong Zeng– VDLSG Chair Presented to SC-214 Plenary May 8, 2013 VDLSG Status Report and Request for." Federal Aviation Administration GOLD Amendment Program By:Tom Kraft Date:8 February 2012 Presented to:SOCM/2 Seminar. 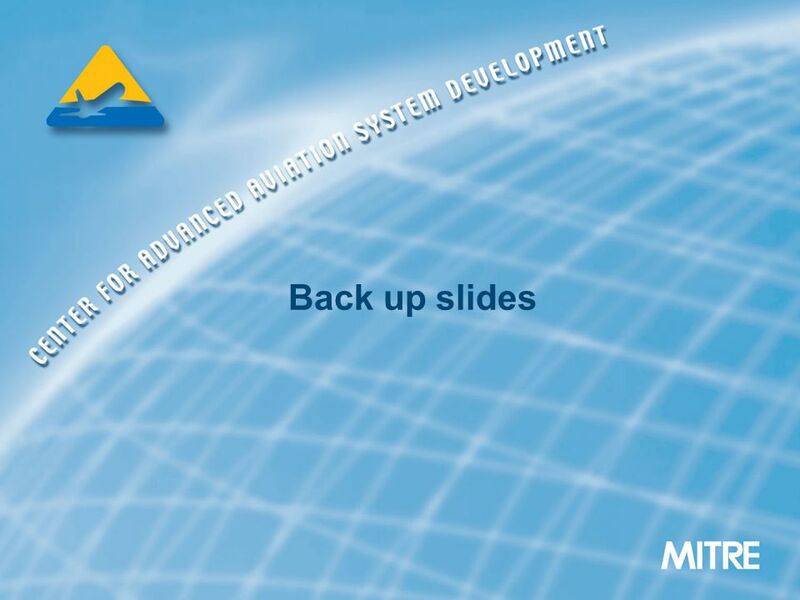 1 Marinus C. F. Heijl Acting Director Air Navigation Bureau ICAO 30 March 2007 SYMPOSIUM OUTCOMES AND THE WAY FORWARD. 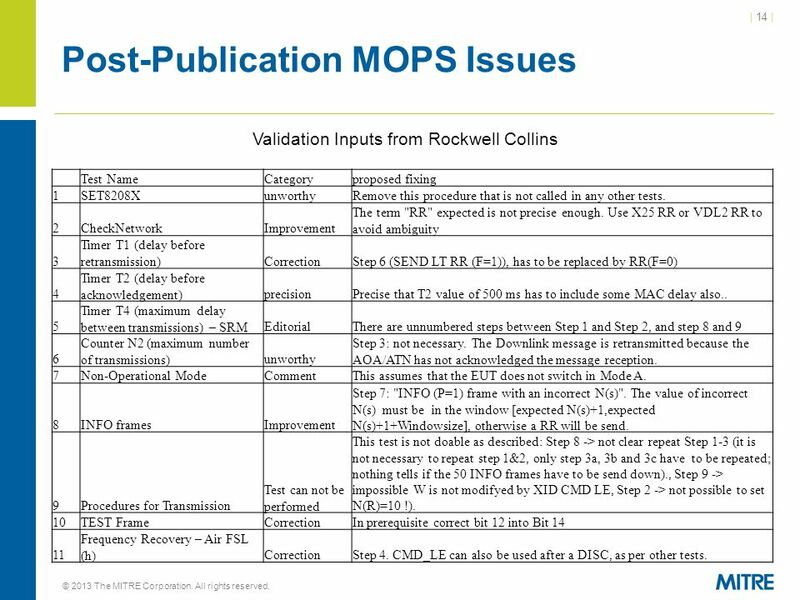 1 Glenn Research Center ICAO ACP Working Group M Iridium Sub Group Overview Bob Kerczewski Mike Meza NASA Glenn Research Center Iridium AGC-FG and NexSAT-SG. Federal Aviation Administration International Civil Aviation Organization INFORMATION PAPER AERONAUTICAL COMMUNICATIONS PANEL (ACP) 20th MEETING OF WORKING. 1 LINK European Organisation for the Safety of Air Navigation ICAO WG N Brussels July 3 rd -6 th Presented by Eurocontrol – Martin Adnams.